You could be forgiven for thinking “do I really need to Tune my range Rover SVR” and the truth is you don’t, it’s a great vehicle, it does not have to be tuned, but then of course, there is the other perspective, just how much faster and better could it be – its time to find out with the VIP Design Range Rover SVR performance tuning and power upgrades. 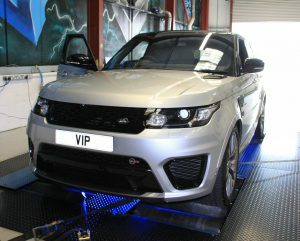 A VIP design Range Rover SVR remap and tune will deliver 55bhp, a great increase in throttle response and pull across the whole rev range, its really quite dramatically improved, but if you really want to improve your range Rover SVR performance, add one of our upgraded supercharger pulleys and a pair of high performance sir filters. This combination will take your SVR tuning and power up another 70bhp, it’s really quite incredible to drive, a 2.5 ton 4×4 with supercar performance. VIP Design can also offer a range of additional items and custom services for you and your Range Rover, including inside and outside styling parts, exhaust systems, and further performance upgrades, like our 650bhp upgrade package. As well as SVR tuning and styling, we offer services for many other makes and models, including Jaguar, Bentley, Lamborghini and Aston Martin. VIP design offer UK wide collection and deliver for our Range Rover SVR Performance tuning and upgrades, and we also offer mail order and drop ship services to our international clients. We can alos offer tax free sales and service depending on your location, if you are outrside of the EU please be sure to let us know.